I’m actually being half-serious when I say that today’s post very well could have been “Re: Re: Do Western Christians Want Martyrs?”. It’s an extremely relevant topic, and I hope that you’ll take the time to read what Kat had to say, as well as Gordon’s response. No, instead what I have for all of you is another one of my rarely shared new life experiences, this time being the hour and a half I spent on Wednesday night trying to escape a series of dark locked rooms. running your own farm, etc. ], this is an example of an activity that mimicks a video game. That is, and realize I don’t use this word lightly, neat. It’s super neat. I should probably get to what my time with it was actually like, though. To help prime your expectations a little bit, the course my friends and I went through was titled “Haunted Hospital”. 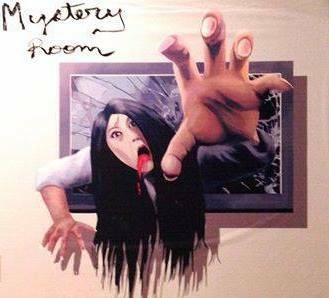 To backtrack for just a second, the establishment was, as the title of this post suggests, Mystery Room. Located a little bit further away from downtown Toronto than I might like, the one-story unit can be found among other such businesses as a flooring supply store. Let’s just say I wasn’t anticipating being blown away. The interior also didn’t inspire much more confidence. Bedecking the walls were illustrations that would have felt more at home in certain Filipino tourist attractions [people will back me up on this]. The main room sported a giant cage against one wall, one of those 3D floor drawings, and a register where we were given flashlights and a timer. Between the the three of us we had varying degrees of experience with real-life room escapes. My close friend had done his first only a few hours earlier, and his friend had been through a number around Ontario. We were walked through darkened hallway before a door, where we synced up our timers with theirs before entering and shutting it behind us. Disorienting is probably the right word to describe the first few minutes. You’re waving your flashlight around wondering what exactly to do, and with the ever-present knowledge that you only have so long to get out. Pieces of furniture were swiftly opened and overturned to find items, slips of paper, anything that will lead to opening the first lock and allowing us to pass into the next area. Now I don’t want to spoil the exact puzzles and obstacles that we had to make our way through on the unlikely chance that you’ll try this exact course yourself one day. Allow me to say, though, that it involved swinging doors, a number of mirrors, a blacklight, and more math than I think any of us were comfortable with. Not only that, but it was incredibly enjoyable. We were only given an hour to make our way to the exit, and it melted away like it was nothing. Even with the many, many hints we received [you can use a phone on the wall to ask for help] we still found ourselves second-guessing every move and brainstorming solutions to problems we might not even have had to solve. The extra half hour was granted to us free of charge due to some . . . complications my other two companions had endured earlier. Seriously, though, this probably should’ve been us. Speaking of charge, regardless of the size of your group the cost comes to the low end of twenty-some dollars per person. And it is entirely worth it. I said it was incredibly enjoyable just a few paragraphs ago, but it really is a great time. Not only was our course fueled by the thrill of feeling the combination lock snap open, the group of teenagers a few rooms over were having the time of their lives. We kept hearing excited screams along the lines of “It’s Roman numerals!” echo through the walls, and it’s obvious we weren’t the only ones having fun. This was an experience that I can’t recommend highly enough. If you have a group of friends [honestly, the more the better] and you can find one in your area then definitely try it out. It’s a form of entertainment that relies on you engaging both your mind and body and other people; it’s a gosh darn triple threat. Whether at this establishment or another, this is definitely the kind of thing I’m going to be doing again, hopefully in the very near future. This entry was posted in bizarreness, Culture War Report, games, video games and tagged activity, challenge, clue, culture war report, escape, fun, game, Haunted Hospital, lock, math, Mystery Room, puzzle, real-life room escape, room, thinking, Toronto, unlock, video games. Bookmark the permalink. That sounds awesome! I wonder if there are any here? Was it scary/spooky at all? The scariest thing hands down was a mannequin with a sheet over it. Everything else, the hokey spoooooky drawings and stuff on the walls, wasn’t much to write home about. You could try checking this out, though from what I can gather from the site it’s closed for a little bit. I think culture war reports like this are one of my favorite things CWR does. This sounds really cool and isn’t something I would have heard about otherwise. THIS. I am all about this. 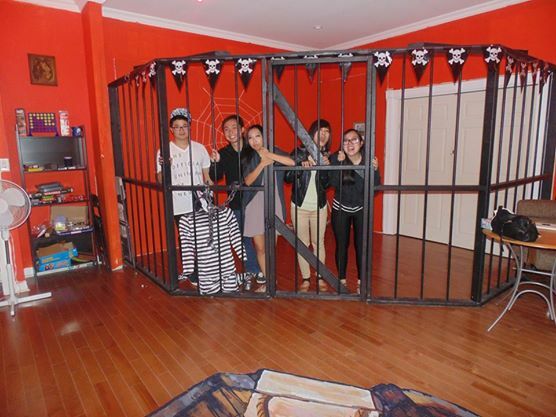 A few years back I got a few friends excited enough about the idea of making our own haunted house that I got to do this. We only had two rooms to work with, so I made sure the participants had to solve some basic puzzles in each room to get out. We made it pitch black and gave them muted flashlights and filled it with some really scary stuff, most of which was live actors. I loved it. I would love to make one like that again, and would also love trying one out myself. Horror is a really great element to add to this sort of activity, just because it forces you to be hyperaware of elements that have nothing to do with the actual puzzles that need to be solved. You should try searching online for similar places near you. I know they’ve been increasing in popularity, so there may be one around that’s closer than you knew.